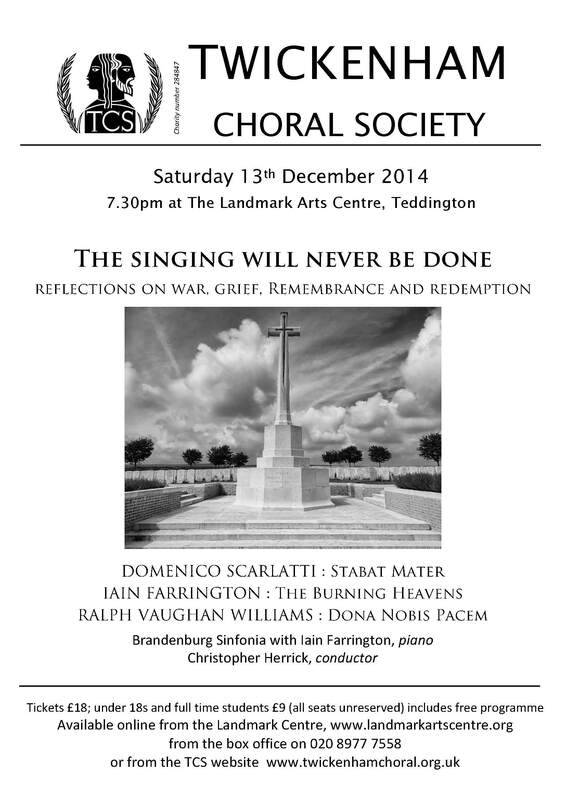 On 13 December 2014 Twickenham Choral Society are giving a First World War centenary commemoration concert at the Landmark Arts Centre, Teddington, starting at 19:30. The programme comprises Domenico Scarlatti’s Stabat Mater, Iain Farrington’s The Burning Heavens (which sets several of Siegfried Sassoon’s war poems) and Ralph Vaughan Williams’ Dona Nobis Pacem. As a 2nd tenor in the choir, I’ve written the programme notes for the concert. These look at the music in the concert, Vaughan Williams’ war service, and some of the effects of the war on the local area. In that context I’ve taken a brief look at the service of a few local men, and so I’ve smuggled in one of the men named on the Surrey Association roll of honour, John Harley Bridges Hesse (Kingston) as before he was commissioned in to the Army Service Corps he was a Teddington resident. I’ve also created a community on Lives of the First World War to group together all the men whose service gets a mention in the programme. This also includes the choir’s second conductor, Charles Thornton Lofthouse who served as an officer in the Manchester Regiment. Tickets are available via the Landmark Arts Centre website. This entry was posted in Uncategorized and tagged First World War centenary, John Harley Bridges Hesse, Ralph Vaughan Williams, Twickenham Choral Society on 04/12/2014 by davidunderdown95.